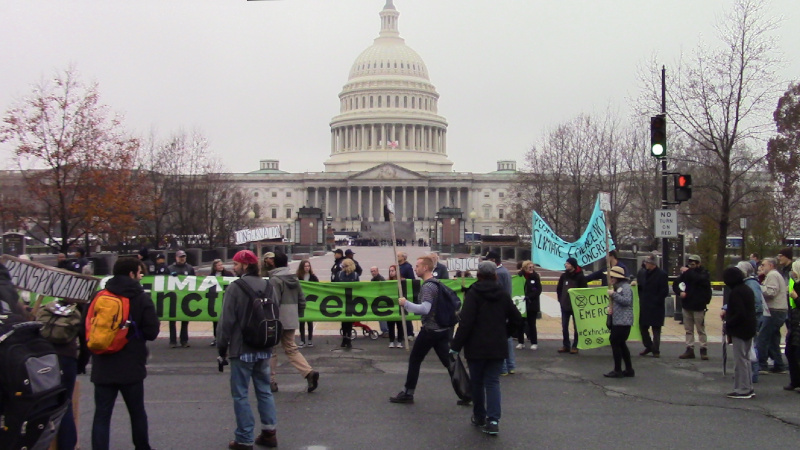 On the 2nd of December, one of many "Extinction Rebellion" events held across Turtle Island demanding action on climate change was held in front of the US Capitol. 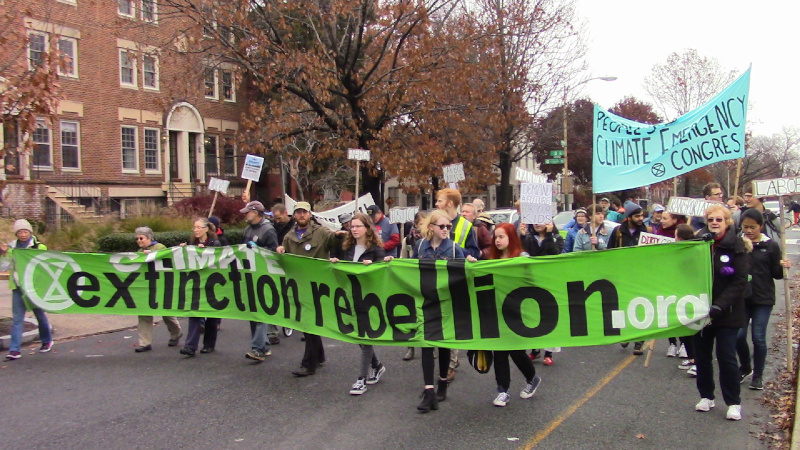 Activists assembled in a nearby park, read out a statement of rebellion against the US government for ignoring climate change, and marched to the Capitol. Upon arrival they convened a People's Climate Emergency Congress on 1st street, the Capitol being closed off to prepare for HW Bush's funeral. This is as hurricanes and wildfires grow ever stronger and more numerous and the sea has begun to rise against coastal cities. Meanwhile, Donald Trump denies that humans have anything to do with climate change in spite of overwhelming scientific evidence and pulled the US out of the Paris climate treaty. As further talks are taking place, the US is on the sidelines, reportedly staging a pro fossil fuels event in opposition. The fascist leaders Trump and Bolsonaro both have the dangerous capacity to torpedo global efforts on climate change simply by denying the cooperation of their countries. There is even a theory that climate change has played a role in the recent global rise of fascism simply by damaging agriculture and forcing people to migrate from ruined farms. The Syrian civil war may have started because climate changes forced rural farmers into cities and the two populations had different values. When that erupted into war, millions were forced to flee and selfish Europeans have responded with the growth of fascist parties such as the Golden Dawn in Greece, and far-right Brexit campaigners in the US. Some have called for a mobilization on the scale of WWII to defeat climate chaos. This however may well require finishing WWII itself by defeating fascist leaders like Bolsonaro (in Brazil) and Donald Trump(in the US). Removing Trump may be a precondition to any action just to stop fossil fuel growth(much less any kind of phaseout)on the part of the US government. Since the government has committed itself to doing nothing, activists in DC declared themselves in a state of rebellion, holding a Congress of their own right in the US Capitol's face.